Finance Minister Pravin Gordhan was impressive on Monday in his first media briefing since returning suddenly to the post. But can he save the the institution from the damage the president has done? By GREG NICOLSON. Pravin Godhan walked into the room, facing 18 TV cameras and over a dozen still cameras. It was full of journalists, with more watching on a feed to Cape Town. The briefing would be broadcast live across the country. The markets, and those calling for the president’s recall, were ready to react. The minister laughed off the spokesperson’s mistake and launched into an hour-long press conference, interspersing it with with firm assurances on the state’s commitment to responsible financial management. Dark clouds gathered over Pretoria, but the storm President Jacob Zuma began last week by replacing Finance Minister Nene with David van Rooyen seemed finally over. After Zuma announced Gordhan’s appointment on Sunday night, on Monday the minister said the right things and he does have enough respect to be taken seriously. In a navy suit and light blue tie, he appeared with Deputy Minister Mcebisi Jonas, Reserve Bank Governor Lesetja Kganyago, and Treasury Director General Lungisa Fuzile, expressing “absolute confidence” in Fuzile whose contract is up for renewal next year. He acknowledged the circumstances, was gracious towards Nene and hardly mentioned Van Rooyen. He was approached over the weekend about returning to the Treasury post, which he led from 2009 to 2014, and he took the position after speaking to his family, despite suggesting it would limit his chances of retiring soon. While trust has to be gained, Gordhan said he wants to restore confidence by “doing the right thing”. 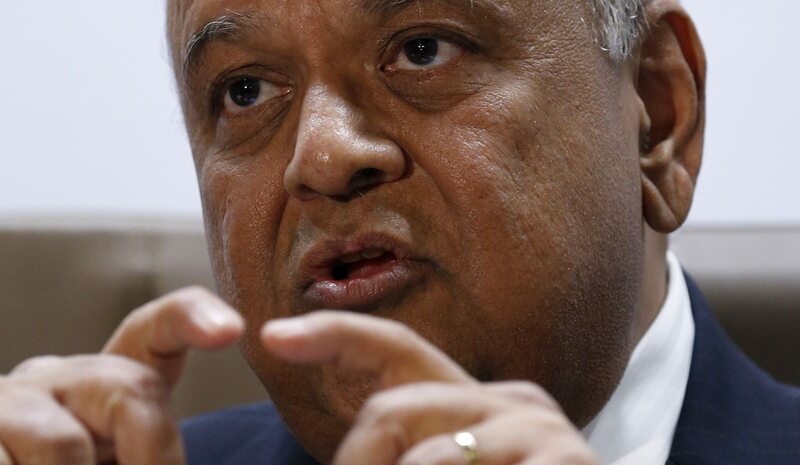 Gordhan wouldn’t comment on the stipulations that might have come with the job or the president’s motivations for the multiple cabinet shifts, apart from citing Zuma’s statement that he had listened and acted. “There are times when you have to admit there was a miscalculation there needs to be a review of the decision and we need to move on to a new scenario and I represent the new scenario,” said the minister on Zuma’s decision. Gordhan was firm and optimistic, but speculation has abounded on why Zuma sacked Nene and appointed the unknown Van Rooyen; it has knocked both the president’s and the Treasury’s reputations. Gordhan repeatedly stressed on Monday that Treasury would implement “sound fiscal management”. Pro-poor programmes won’t be cut, efforts would increase to ensure efficient spending, state-owned entities (SOEs) would be reigned in, inclusive growth will be promoted, and downgrades avoided, he said. “South Africa has a solid history of sound macro-economic policy management. Since the dawn of democracy, our government has advanced policies that are meant to address inequality, reduce poverty and unemployment,” said Gordhan, promising responsible expenditure and fiscal consolidation. He assigned questions to his colleagues and looked at his phone. The damage done to the rand and the stocks had already been partly mitigated, he said, citing the numbers. But everyone wanted to know about the speculated reasons for why Nene was replaced. There are allegations he lost his job for refusing to agree to the deal South African Airways (SAA) chairperson Dudu Myeni proposed relating to Airbus, which would see a leasing agreement from Airbus go through a South African third party. Gordhan said he isn’t aware of any decisions made on the issue under Van Rooyen. “We’re really serious when we say good governance is non-negotiable. It’s time that individuals or groups of individuals stop playing with state entities, whether they’re SOEs or other government components, as if it’s a personal toy from which you can extract money when you feel like,” he said, also mentioning Zuma’s statement that the state would not be told what to do by SOEs. He said he will speak to Myeni in the next 24 hours over the phone and engage the SAA board next year. While Gordhan is open to discussing proposals, it seems unlikely he will flip Nene’s comprehensive rejection of SAA’s changed plan to lease from Airbus. Then there was the nuclear procurement process. On Monday, Business Day reported that Cabinet last week approved the decision to open up the tender process on plans to build nuclear power plants in South Africa, reported to cost up to a trillion rand. Despite a post-Cabinet briefing, that decision, which was confirmed by Gordhan, wasn’t mentioned to the media and Nene, who had questioned the affordability of the deal, lost his job shortly after. “Don’t play with state institutions because at the end of the day it’s not the current generation that suffers only. In an institution like SARS or Treasury or the Reserve Bank or other similar institutions you affect generations to come. You affect generations to come,” he said. Growth and tax changes allow for social grants and we should be careful to protect these institutions not spread unsubstantiated rumours, Gordhan continued. In his first briefing since the storm saw him returned as finance minister, Gordhan was combative, confident, informative and funny. But clearly the crisis isn’t yet over. He was impressive, but so was Nene, and the question remains why was Nene fired (if we discount the claims he was being redeployed, which are hard to believe) and why was Van Rooyen appointed? Cabinet’s quiet agreement on nuclear procurement says a lot and shows despite Gordhan’s impressive ability to calm the storm, the climate remains hostile. Photo: South Africa’s Finance Minister, Pravin Gordhan, gestures during a media briefing after he was re-appointed to the position on Sunday night by President Jacob Zuma in Pretoria, South Africa December 14, 2015. REUTERS/Siphiwe Sibeko.